Six-speed paddleshift automatic available now as a £2,000 option. Previewed last October, Lotus has now officially launched a six-speed paddleshift automatic for the Exige S. Said to be both faster and more eco-friendly than the manual, the automatic box can change gears in 240 milliseconds, while Sport and Race modes sharpens throttle response, and column mounted paddles offer sharp overrides. Mated to the 346-hp 3.5-liter supercharged V6, the Exige S Automatic sprints from 0-62 mph in 3.8 seconds – 0.1 seconds quicker than the manual, and can lap the carmaker’s Hethel test track marginally faster too. Borrowing the same Toyota-sourced torque-converter transmission from the Evora IPS Coupe, the automatic box has been tweaked for the Exige S, with other benefits including improved fuel economy, up by 1.4 mpg to 24.4 mpg, and reduced CO2 emissions of 13 g/km to 222 g/km. The automatic box also adds a mere 6 kg to the curb weight of the Exige S, which comes in at 1,183 kg. 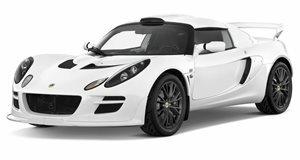 Commenting on the new option, Lotus CEO Jean-Marc Gales, “Expanding the Exige range, with a new automatic gearbox, opens up a new market for those who prefer using a paddle shift with the alternative of an automatic gearshift. "We expect that the Exige S Automatic will account for over a third of the total global sales for the Exige S range as many drivers will appreciate the involvement of a manual paddle-shift and the convenience of an automatic.” Available to order now, the automatic transmission is a £2,000 option.